This sheet came to light in an album of around fifty hitherto unknown drawings by Fuseli, covering most of his career and including a wide range of subjects, assembled by Harriet Moore, the daughter of Dr James Moore, a close friend and patron of the artist; the important series of Roman period drawings also belonged to her before passing to her long-lived youngest sister Julia. The present study almost certainly dates from 1771, and is part of an important group of related drawings, one of which is in the Öffentliche Kunstsammlung Basel. All are in the same elongated format, the groupings of Michelangelesque figures each signed with the distinctive spelling Fusili, and most are numbered. 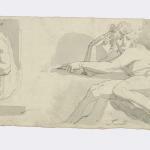 Here Fuseli has combined reminiscences of figures by Michelangelo with his own imagery. 'Subliminity of conception, grandeur of form, and breadth of manner are the elements of Michelangelo's style' he later wrote. Gert Schiff suggested that the group might have been made in preperation for a cycle of figures illustrating Dante's Divina Commedia, which Fuseli had admired since his youth.